"Aren't you a little short to be a stormtrooper?" are the first words that Leia says to Luke Skywalker as he tries to rescue her from the Death Star. Her next line is even better. After Luke again tries to introduce himself, she merely asks, "You're who?". It's one of my favourite scenes from the movie (I like Leia best when she acts like a Princess)... and to commemorate it, I've just converted and painted this miniature for Imperial Assault. It was a dead easy job... off came a Stormtrooper's head with a hobby knife. In its place went the head of the Skywalker miniature from the Basic Set. 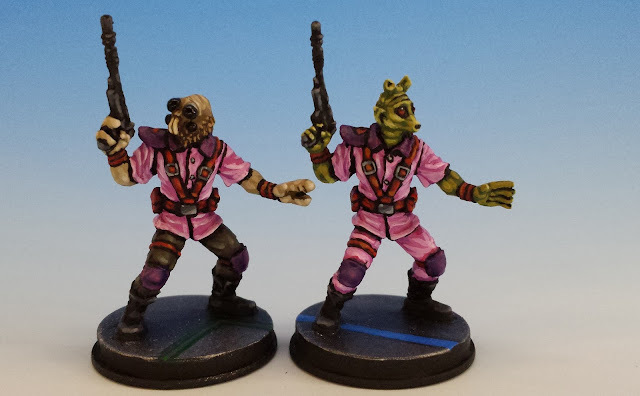 My next conversion was a little more complex: I transformed the "Hired Guns" from Rodians (i.e. Greedo) into the Aqualish race. I've always had a soft spot for the Aqualish... 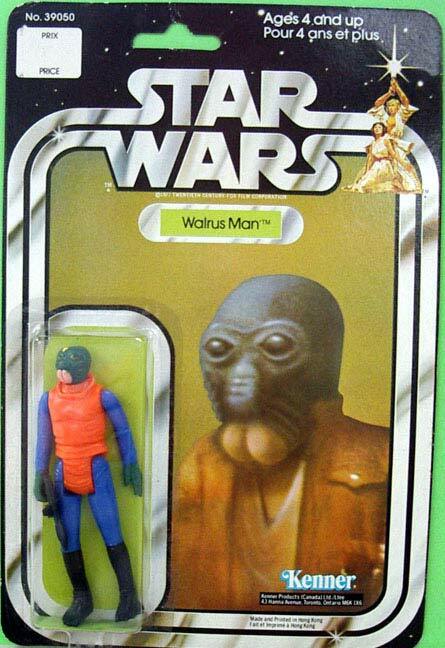 I believe my first Kenner Star Wars figure was "Walrus Man" (also known around my house as "Bum Face". I was not a witty child). Like in my previous conversion of the Mon Calamari Saboteurs, I utilized some heads from WOTC Star Wars miniatures. But I also wanted to add my own flare. After reading up about the Aqualish race, I discovered that they have a subspecies named Ualaq with four eyes and three fingers. Combined with their tusks, the four eyes give these aliens a spider-like visage that it almost disorienting. So, this is what I set out to create. I used some greenstuff to make his primary eyes even more bulbous, and then added in the secondary pair. I also used greenstuff to reshape the hands. When it came to painting, I wanted to make him as creepy as possible, so I gave him the light brown pigmentation of a Crab Spider. They eyes were easy to paint: black, with a coating of gloss varnish. It's not exactly the porpoise-like face of Ponda Baba (the true name of Bum Face in A New Hope)... but it at least looks thoroughly alien. And here's a shot of him with the unconverted Rodian bounty hunter. 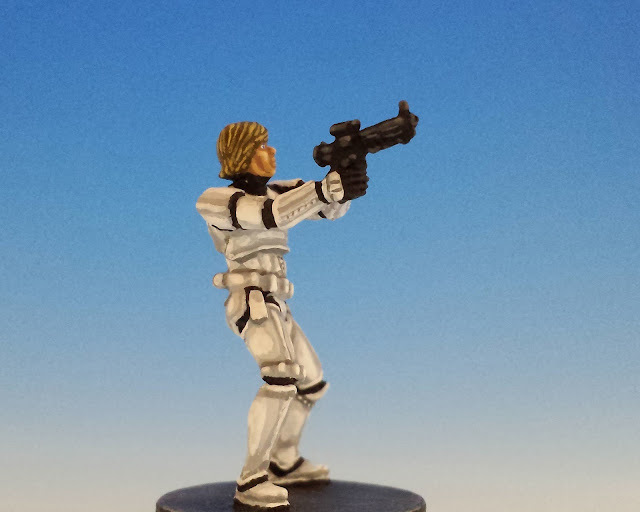 I've put more pictures of these conversions on my permanent gallery of Star Wars Imperial Assault miniatures for the Rebels, Imperials and Mercenaries. I hope you enjoy! Wow, your skills are amazing! I really like what you did there! 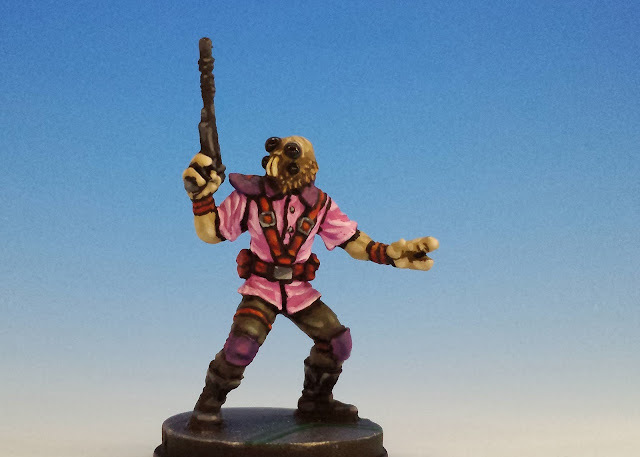 And apparently you found yourself a recipe for those pink schemes! Can we not get a duros figure crafted Sir Sully?